Days 22 & 23: End of rainy season? Bring on the clear skies! I quickly noticed that it was a lot noisier in my town on July 1st! 😛 The cicadas are now making my museum’s bug collection a bit noisier too. And I caught an arapaima for the first time (other than island tours). Look forward to what else might be new this month! Bluebell’s paths have changed again, and they look beautiful! I especially like how they look with the pink and white roses here. Also, my town tree has grown a bit. Now it’s around the same size as the other trees around town. The first time I walked in on one of my neighbors sleeping, cute! I noticed a new roped-in spot reserved for a neighbor moving in, and it’s not where I plan on putting a path, garden, or community project. Good job, Opal! Vladimir is thinking about moving, and I didn’t object. Though I’ve read on forums that saying goodbye to a neighbor doesn’t always result in them leaving. I’ll miss the surety and easiness of managing neighbors in AC:WW. If he moves, I’ll be glad of the opportunity to straighten up this path, which currently has to wrap around his house. Since the sky cleared up, I decided to go ahead and get my town’s dream address. Not because my town’s anything special, but hey, why not? Katrina was in town again today. She said my lucky item was men’s bottoms (is that pants in general…? ), which I passed on for now, but I’ll keep it in mind if I start tripping. Club lol has multiple functions: the night club, the solo performances by K.K. Slider with his guitar (like in previous games), and also comedy performances by Shrunk in the daytime. If you bring Shrunk some food, he’ll tell a joke, which in turn gives you a new emotion. Violet’s house has expanded recently, it’s now the same size as Estel’s house (full-sized main room, medium-sized upstairs room). I tried refurbishing furniture for the first time with a Rococo sofa. Posted on July 2, 2013 by Amy •	This entry was posted in AC:NL, AC:NL WiFi, Citalune and tagged Animal Crossing. Bookmark the permalink. Hehe, I did! Thanks for the extra information about it! I think I’ve seen a pic recently of what the Gothic Black/purple looks like, and I might want to test to see what the Gothic Yellow version looks like, but I do think the Gothic White style might look nice in Estel’s house. 🙂 I’d like to go with an elegant/regal feel to her rooms, and have a more cozy feel in some of my other characters’ houses. Omg. 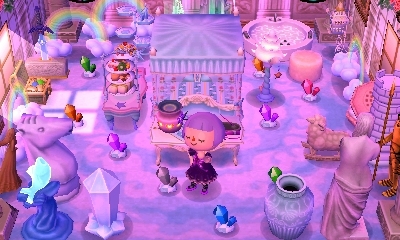 Pretty town ❤ for some reason, I tend to use you as inspiration :3 especially after I saw your town in Wild World. Which is why im trying to get a lot of hybrids 🙂 I was planning on making my rococo gothic white too! Only because it matches the wallpaper and floor. And cuz i like pink 🙂 if you couldnt tell yet by my paths. And flowers…. Eheheheh. Aww, thanks! ❤ You've been really successful in growing hybrids, and your town looks great! Think you could give us the patterns for the water/rivery thing and the new path with the pink and white roses? your town is beautiful! Oh, those pictures with the river patterns and pink bricks weren’t from my town, sorry for the confusion! That was a town called Bluebell I visited. 🙂 I think some of the patterns are from here and here, really beautiful designs! Yay!! I’m so excited to get a tan in my Wild World game, and catching tarantulas, since they don’t come out during rainy season. I love the pictures you took with the rainbow! So pretty!! Yeah, it’s a shame controlling your neighbors seems to be trickier in this game. It’s still possible, I think, but the 100% surety of AC:WW’s system isn’t there. In AC:WW, you just had to talk to them until they said something like “Oh no, I lost my passport!” or “What am I gonna do about the cancel penalty?” In New Leaf, you can try to convince them to stay or leave, but they might change their mind, it seems. The Dream Suite is a little confusing to explain, I had trouble figuring out how it worked as well before I got the game myself. xP The purpose of the Dream Suite is to allow you to explore other towns without having to add each others’ friend codes. All you need is the person’s Dream Address, and you can visit their town and explore it in a “dream” state. 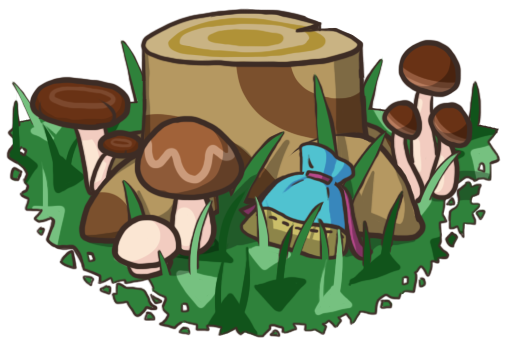 In a dream state, you can’t mess up their town in any way that will be permanent — axing down trees, running through flowers, etc. (so it’s completely safe) You can even visit random dream towns of people you don’t know at all! It’s just fun to visit other towns to see what different things people have done with them in terms of landscaping, projects, etc. 🙂 You can also get your own town’s Dream Address so that others can visit it. Hehe, sorry if that’s confusing, there might be YouTube videos (if you search “dream suite new leaf”) that explain it better. -.- How are you able to have so much patience in this game and in Wild World? I’m already tired of placing paths… Hahaha. But I FINALLY achieved a perfect town and I found a Jacob’s ladder last night!!! I have a question. Everyday, do Jacob’s Ladders grow if you keep up ur perfect status? Because yesterday, I found one and today, I found another one. Will they constantly keep growing? Haha, speaking of villagers who don’t move when you tell them to, just yesterday Paula from my town told me she was moving and the only options were, “Please don’t leave me!” and “Who are you?”. I did feel the 2nd one was the wrong response but still selected it because I really wanted her to move, and sure enough, she said the move was off because us girls needed to spend more time getting to know each other! That rainbow looks so amazing x3 I haven’t seen one in my town yet. It’s so vibrant! Hehe, the town hall pic is pretty cool; the flag is high enough that it looks like there’s a little window of nighttime in the clear blue sky. Wowww, that was fine timing with the disconnect. I guess you didn’t get the Märchen roof then though. I’ll open my gates again in case you still want it. Hmm, that’s interesting, maybe you can tell if they’re going to call off the move by the answer choices. Though I thought my dialogue choice for Vladimir (“See ya!”) was kind of rude, and he’s still packed up to move today. 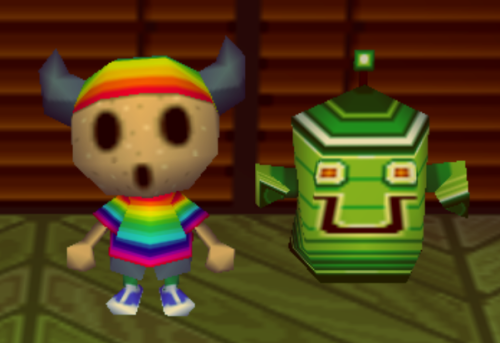 Woooah, the gyroid face is so creepy, and the giant shadow is cool! They seem to be more than just rumors! I heard about Ck’s town too! I look forward to visiting it. :3 Her stash of hybrids is unbelievable as well! OMG, your rain outfit! 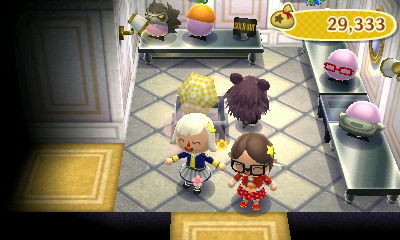 I was gathering both outfits (polka-dot and yellow) to see which one would look cuter, but I think I’m gonna go with yellow. Thanks for being my mannequin, hehe! xD Speaking of that, did you get your first mannequin yet? Reading about the moving terms for this game is really intense! Like, after you tell them they can move, you have to hide from them to keep them on the right tracks towards leaving! Hehe, I’m glad I could help you out in making that decision! I like both outfits a lot. 🙂 We might not need to be wearing them as frequently, though, with the end of the rainy season. But it’s good to have more sunny days now! I have two mannequins; I think Mabel gave me one and Sable gave me one. I probably never posted about the mannequins, whoops. Yeah, I especially think the rocks-getting-in-the-way is a little ridiculous! >_< You'd think that since we can demolish bridges, benches, fountains, etc., we could also be able to demolish or move a rock, but no, they're there forever! Whoa long time since I’ve spoke to you, huh? Any way, guess what?!? I’ve got AC new leaf but I’ve JUST started so I haven’t got the HH Showcase or the islands or the dream suite (etc). But anyway here is my 3DS FC. (Btw I’ve already registered you) 1392-4174-0643. Enjoy!! Would you like to make a wifi meeting today? Since your time is -4 mine should be +4 because I live in the UK. I’ve got school now. And so I cannot wifi like right now 😛 Anyway let me know if you wanna wifi. btw I like Estel. She is really pretty! !